The stakes are always high at The New York International Auto Show which takes place in Manhattan every year and draws millions of visitors from around the world. Automakers must impress with their latest designs and create a "buzz" or else. 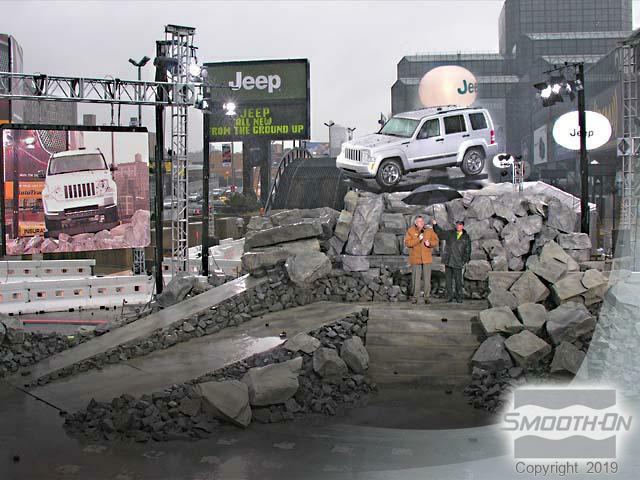 For the 2007 show, Beyond Design, Inc. and PRG Scenic Technologies collaborated on a project to launch the new 2008 Jeep Liberty and, as usual, the deadline was "impossible" – months of work had to be done in weeks. 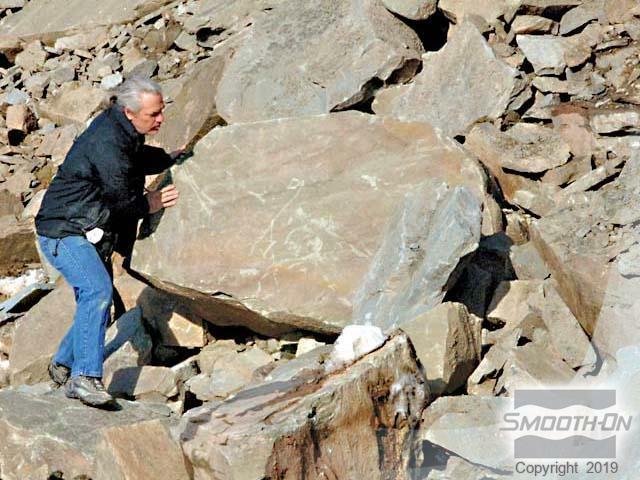 The Theme Strategy: To dramatize the launch of the re-designed model, it was decided that having the Jeep rise into a "rock scape" environment would help convey the rugged durability of the vehicle. 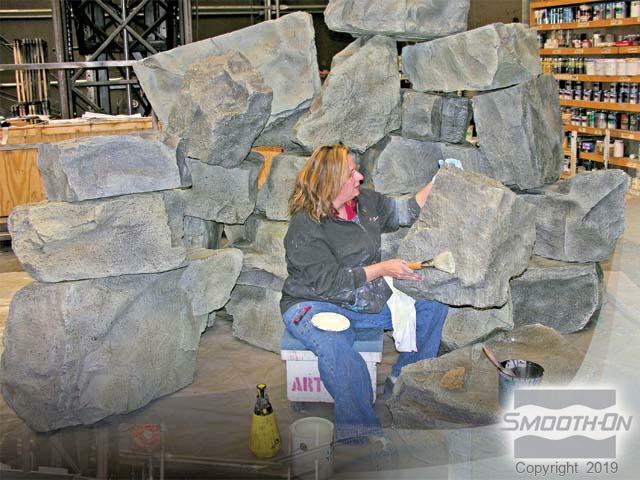 The set design requirement meant that over 200 lightweight, realistic looking rocks would have to be created, transported to Manhattan, assembled as a display and then taken away after the event. With the show just weeks away, Bill Klopping (President of Beyond Design) knew that there wasn’t time to employ conventional mold making and casting techniques. He drew on his years of theming experience and decided on a spray system that would allow him to make production rubber molds and castings quickly. Rock Shopping . . . Bill Klopping chooses models that were transported from the local quarry to Beyond Design’s production floor, some weighing in excess of 3 tons. 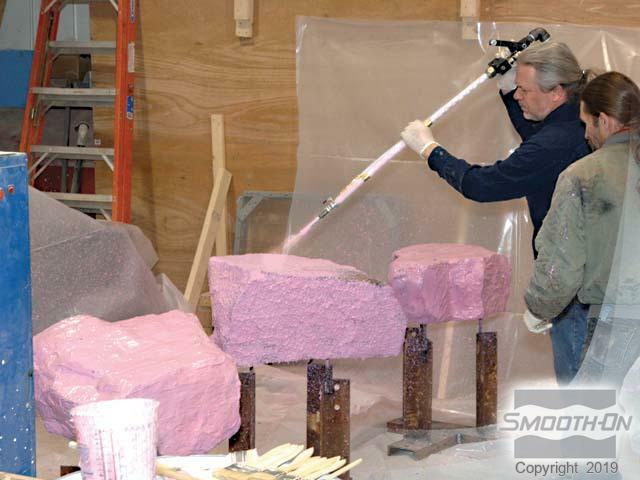 Rock models were mounted and spray equipment was prepared to spray Mold Max® 30 silicone rubber. The static mixing tube mixes Mold Max® 30 Parts A and B thoroughly. 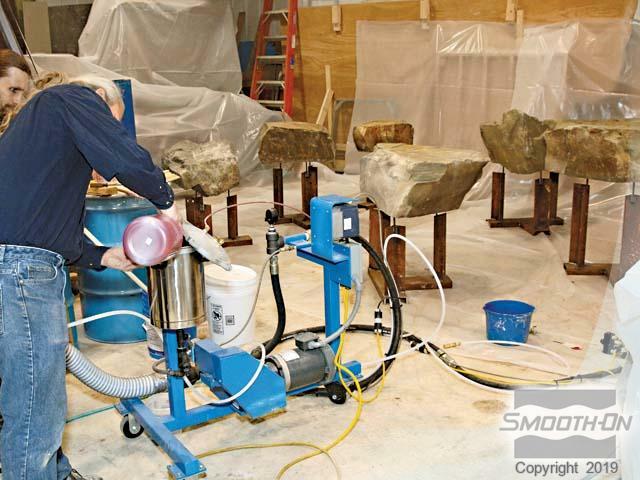 The output rate of the machine enabled coating several rock models in a matter of minutes. 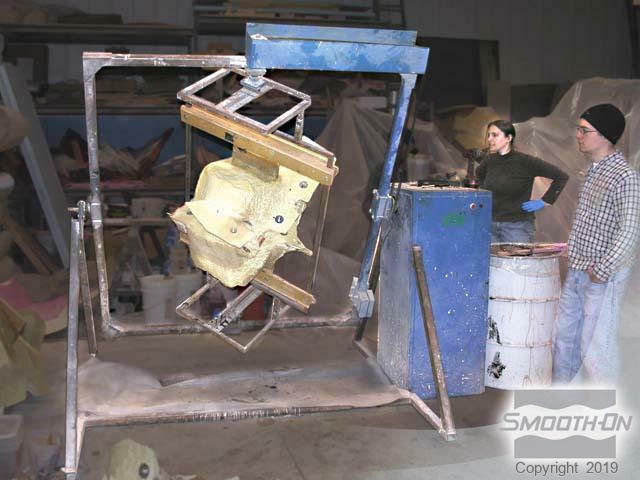 Support shells are applied to the rubber molds and the mold structure is secured to a rotational casting machine. Smooth-Cast® 65D urethane plastic is tinted with SO-Strong® black, poured into the mold and rotated for 15 minutes. 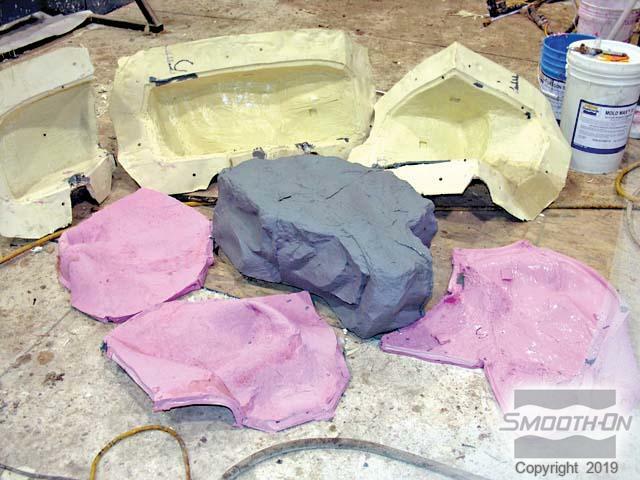 Demold - Tinted Smooth-Cast® 65D castings come out of the rubber mold ready for painting. At Scenic Technologies, post finishing went quickly. 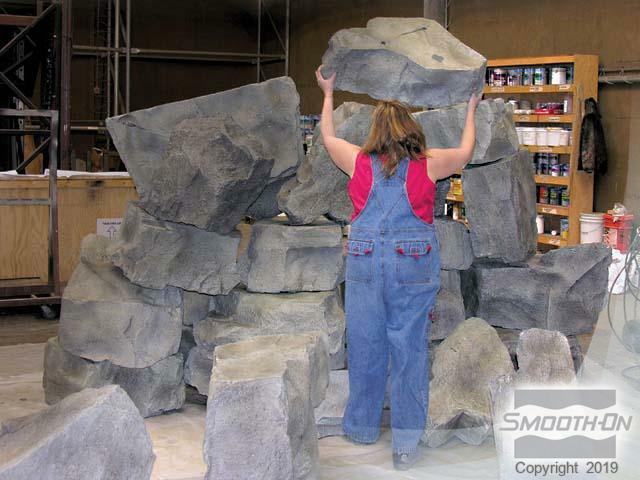 The individual castings look like they weigh a ton, but can be easily handled by anyone. The 65D plastic also has great impact resistance and can really take a beating if dropped in transit, stepped on, etc.